The theme for National Migration Week 2018, “Many Journeys, One Family,” draws attention to the fact that each family has a migration story, some recent and others in the distant past. Regardless of where we are and where we came from, we remain part of the human family and are called to live in solidarity with one another. For nearly a half-century, the Catholic Church in the United States has celebrated National Migration Week, which is an opportunity for the Church to reflect on the circumstances confronting migrants, including immigrants, refugees, children, and victims and survivors of human trafficking. Download the Migration Week toolkit with suggestions for raising awareness in your community and conducting advocacy. January 7: Send electronic Post Card to the House of Representatives. January 8: Call In Day to support reform. January 9: Social Media Day for immigration reform. See below for links to help with your actions. Wednesday, Jan. 8 – Participate in the JFI National Call-In Day to Congress. 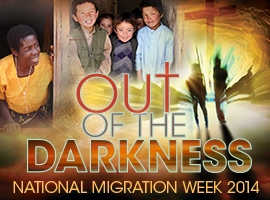 Find out more at the USCCB/MRS´National Migration Week homepage. The Missionary Oblate JPIC Office is inviting you to use this opportunity to raise awareness and educate your communities on the issue of immigration and Catholic Social Teaching. 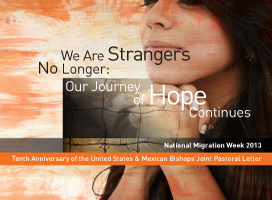 The 2013 theme, “We are Strangers No Longer: Our Journey of Hope Continues,” commemorates the 10th anniversary of the historic joint pastoral letter of the United States and Mexico bishops conferences; Strangers No Longer: Together on the Journey of Hope. The observance of National Migration Week began more than twenty-five years ago by the bishops in order to provide Catholics an opportunity to take stock of the wide diversity of the Church and to work for justice for immigrants. 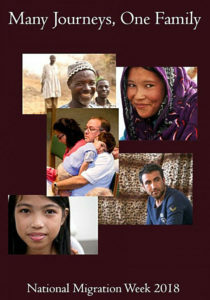 Pope Benedict XVI’s message – World Day of Migrants that will be celebrated Sunday, January 13, 2013.